New Pulp! Adventure: Scentia Besieged! Coming Novembers 1st or November 15th, You Decide! Our latest Pulp! Fantasy adventure is about to go the printer. We’re going to release this beauty on DriveThruRPG on November 15th but you can get your hands on it this Friday! What do you have to do? Why all you have to do is back BEARD! on Kickstarter. You won’t regret it! Beard is the hair-larious card game that will leave you in tears, or at lest drive you to drink! There’s already a preview of Scentia available to BEARD! Backers, but there’s something about the fully edited, color illustrated, final version that just brings so much more joy. Here’s the back cover text. Scentia, southernmost isle of the Charter Confederacy, stands as the border between the archipelago nation and the power-hungry empires of the continent of Iziz. It has stood as a testament to the prosperity that the Charter can bestow, a nexus of trade and a bastion of military strength that profits the Confederacy and protects it in turn. That strength has been sundered, the trade slowly choked off, as old foes from the island’s own marshes rise to overrun half of Scentia in brutal savagery. The surviving residents suffer under the threat of continued attacks and the strain of limited resources. As the proverbial wolves close in, a call for help goes out across the Confederacy. Shall you answer? 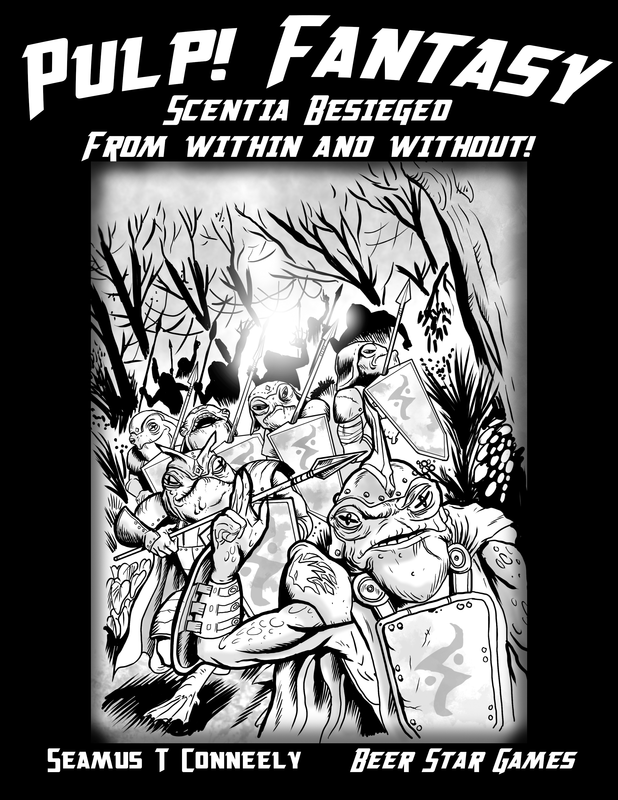 “Scentia, Besieged From Within and Without!” is a Pulp! Fantasy module set in the Gamer Assembly’s Shattered Seas and made using the Pulp! The RPG Core Rules. Light on rules and high on action, it challenges your adventurers to aid a settlement beset on all sides, even from within its own walls. Cross the wilds of Scentia. Uncover the truth behind the foes threatening to overrun the island. Break the siege. – Details on the Shattered Seas Setting, including factions like the Blue-Eyed Wizards and the Salty Lutes! – A complete adventure including premade Player Characters! – A series of plot hooks both for the adventure and for further play! – Details on Scentia itself, including a Bestiary covering the entire island! And Remember! To get this spectacular adventure this Friday, you just have to back BEARD!